I don't have a lot to show for my tinkering over the last few weeks - I keep telling myself that I can make time for the build 'next week'... next week is yet to come! (Top left) This once black stone guard is now shinny and silver. I don't want to be accused of not doing things properly (if not actually over doing things)... this part bolts into place underneath the bike and is unlikely to be seen but is likely to get damaged, but I painted it anyway. 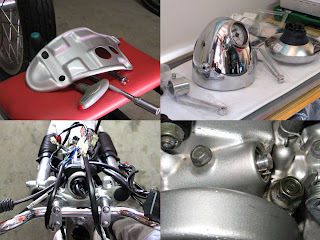 (Top right) The new 'vintage' headlight and brackets are ready to go onto the bike... once the forks are dropped out! (Bottom left) Most of what has to come off the front of the bike has been removed and some of the new electronics have been fitted. (Bottom right) The tacho cable has been removed and the hole in the top of the engine has been plugged... I'm not running a tachometer on the finished bike though I am toying with the idea of mounting a little dial on the side of the headlight... but that's something to think about later.